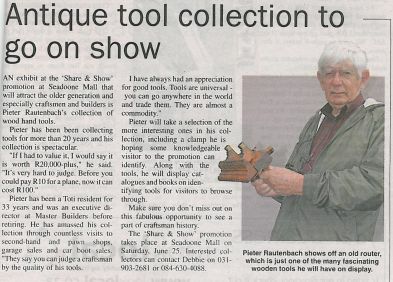 "An exhibit at the ‘Share & Show’ promotion at Seadoone Mall that will attract the older generation and especially craftsmen and builders is Pieter Rautenbach’s collection of wood hand tools. Pieter has been collecting tools for more than 20 years and his collection is spectacular. Pieter has been a Toti resident for 33 years and was an executive director at Master Builders before retiring. He has amassed his collection through countless visits to second-hand and pawn shops, garage sales and car boot sales. “They say you can judge a craftsman by the quality of his tools. Pieter will take a selection of the more interesting ones in his collection, including a clamp he is hoping some knowledgeable visitor to the promotion can identify. Along with the tools, he will display catalogues and books on identifying tools for visitors to browse through. Make sure you don’t miss out on this fabulous opportunity to see a part of craftsman history. The ‘Share & Show’ promotion takes place at Seadoone Mall on Saturday, June 25. Interested collectors can contact Debbie on 031-903-2681 or 084-630-4088."